If your vehicle is equipped with 4-wheel drive, there’s a special section on safe driving in different environments. As a resource for all drivers, we’ve provided a roadside and safety section. And since you own an Isuzu vehicle known for its extraordinary power to haul, chances are you may have considered towing. Which means we’ve got a section for that too. Welcome to Isuzu 4-wheel drive ownership. Your Isuzu 4×4 is ready and willing to take you wherever your sense of adventure leads. Whether you’ve experienced the rugged capability of an Isuzu 4-wheel drive vehicle or are still testing yours out, become familiar with the information found in your owner’s manual and the booklet Driving Your 4-Wheel Drive Vehicle. 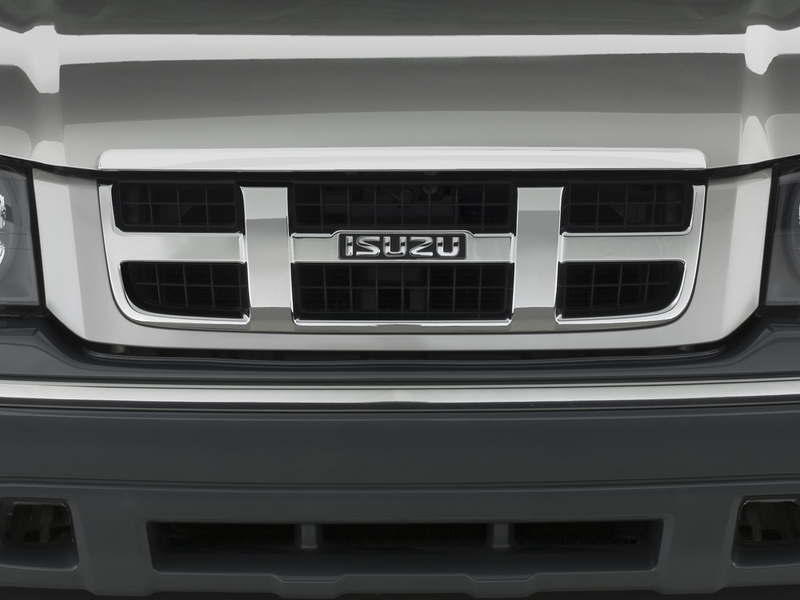 We have outlined some general dos and don’ts in this section, but those materials — provided in the glove compartment of your new Isuzu 4×4 — will give you a more comprehensive understanding of your Isuzu 4-wheel drive’s unique operation characteristics and handling. Avoid unnecessary sharp turns and other abrupt maneuvers that could lead to loss of control, rollover and, ultimately, injury to driver and passengers. Use only the same type and size of tires and wheels, as well as tire inflation pressure, that came with your vehicle from the factory. Modifications may affect the handling of your vehicle, possibly making it easier to lose control, roll over and cause injury. Be sure that all vehicle occupants wear their seat belts at all times to lessen the risk of injury or ejection from the vehicle. Infants and small children should be provided with the appropriate safety restraints required by law. Never allow unrestrained passengers to sit in the cargo area when the vehicle is in operation. To avoid damage to the axles and drivelines, do not operate your vehicle in the 4-wheel drive mode on dry, hard-surfaced roads (i.e., highways, interstates and city streets). However, vehicles equipped with Torque-On-Demand® (TOD) may be operated on dry, hard-surfaced roads in the TOD mode. Always approach curves at normal driving speed. Do not attempt to go as fast through turns as you might in a passenger car. Drive slower under strong crosswind conditions. Strong crosswinds can alter the normal steering of your vehicle and could lead to loss of vehicle control. Exercise caution when driving on slippery pavement (caused by sand, gravel, water, snow or ice) in order to maintain vehicle control. WARNING: If your vehicle goes off the edge of the pavement, slow down but do not suddenly apply the brakes. Gradually bring the vehicle back onto the pavement after you have reduced speed, being careful not to turn the steering wheel too sharply. Keep all four wheels on hard-packed or solid areas if possible. Drive steadily in a lower gear. Avoid excessive speed to reduce the risk of becoming stuck. If you become stuck, try to back out the same way you entered. Slowly apply pressure to the accelerator pedal. Do not spin your wheels. Exercise great caution when changing speed or direction to avoid sliding. If your vehicle slides, steer in the direction of the slide until you regain control. After driving through deep mud, clean the tires and driveshafts of excess mud. Its excess weight can cause an imbalance in the vehicle, which can lead to loss of control and damage to parts. Know the depth of the water before entering it. Do not drive in water deep enough to reach the wheel hubs. Avoid splashing water — if the ignition system becomes wet, your vehicle may stall. Do not drive in “fast moving” water. Drive in a lower gear, with steady pressure on the accelerator to keep from becoming stuck. Tire chains are useful and in some cases necessary or required. Never use tire chains only on the front wheels (to prevent “fishtailing”: when the rear of the vehicle slides out of control during braking). Try to drive on established roads or tracks. Whenever possible, drive straight up or down a hill. If obstacles prevent straight uphill or downhill driving, drive diagonally only if absolutely necessary to avoid sliding, loss of control, possible rollover and serious injury. Never drive across the side of a hill or turn on steep slopes, in order to avoid loss of traction and possible rollover. Never drive over the crest of a hill without first checking the other side. Begin climbing hills in low gear so the engine will be less strained, thus reducing the chances of stalling. Use only as much power as necessary to climb the hill (the tires may slip, spin or lose traction if there is too much power). Come down a hill in the same low gear used when going up. Do not descend the hill in neutral or with the clutch pressed. Do not use the brakes excessively when driving downhill, to avoid overheating them. See your owners manual for details. Your Isuzu vehicle was built to be dependable and safe. We urge the drivers of Isuzu vehicles to be safety-conscious and “street smart” during all driving situations — including those that are unexpected. Familiarizing yourself with the roadside tips found in this section as well as the comprehensive safety information found in your owner’s manual will help ensure the safety of you and your passengers. Turn your wheels from the curb and toward the centerline of the road. If the vehicle were to roll backward, it would stop against the curb. Turn your wheels from the road and toward the curb. If the vehicle were to roll forward, it would stop against the curb. When there is no curb, turn the wheels from the centerline of the road toward the side of the road. Isuzu vehicles are extremely reliable, but if you’re ever faced with a dead battery and are covered by Isuzu’s Roadside Assistance, just call (800) 444-0303, toll-free, and we’ll be there to help, ASAP. However, if you can’t wait for assistance, below is a step-by-step guide to jump-starting your vehicle. Refer to your owner’s manual for illustrative details. Position the vehicle with the good (charged) battery so that the jump-starting cables will reach. Do not allow the vehicles to touch. Check to see that the bumpers do not touch. Turn off all electric motors and accessories in both vehicles. Turn off all lights except hazard flashers and lights needed to light up the work area. Turn off the ignition, apply the parking brake firmly, and shift in automatic transmission to “P” (Park) or a manual transmission to “N” (Neutral) in both vehicles. Connect the first jumper cable from the positive “+” (red) terminal on one battery to the positive “+” (red) terminal on the other battery. Never connect “+” (red) to “-” (black) or “-” to “+”. Next, connect one end of the second cable to the grounded negative “-” (black) terminal of the good (charged) battery. Start the engine of the vehicle with the good (charged) battery and run the engine at moderate speed. Start the engine of the vehicle that has the discharged battery. Remove the battery cables by reversing the step 3 sequence. Changing a flat tire is probably not your pastime of choice. However, as with any unforeseen occurrence, knowledge is key. If you get a flat tire on a busy highway or freeway, wait for help or use available means to call for help. Be sure you’re located in an area where it is safe to change a tire. Turn on the hazard-warning flasher. Put the vehicle in “P” (Park) or, if equipped with a manual transmission, in gear. Set the parking brake firmly. Unload the vehicle of unnecessary or heavy contents. Never use a jack from any other vehicle to lift your vehicle. Never get beneath the vehicle when using the jack. Do not start the engine while the vehicle is on the jack. Make sure the jack is positioned on a level and solid surface. As soon as possible after installing a wheel, have a mechanic tighten the wheel nuts with a torque wrench. Have your flat tire fixed or replaced immediately. When an engine overheats, it’s cause for immediate attention. If you’re covered by Isuzu’s Roadside Assistance, call toll-free at (800) 444-0303 and we’ll come out and help. If that’s not an option, you may have to take matters into your own hands. The engine coolant temperature gauge pointer will move close to the line of “H” or higher. Engine “ping” will become excessive. Loss of engine power will be noticed. Either steam or boiling water will squirt out of the radiator. Safely stop the vehicle away from the flow of traffic. Open the hood when no steam or engine coolant can be seen or heard escaping from the engine compartment. Stop the engine and allow the engine and radiator to cool down. Check for a broken belt or a burst hose. If you discover either, you’ll need to be towed. If neither has occurred, wait until the radiator is cool enough to touch, then open the cap (with a large rag over the cap, just for safety). Add a 50% coolant / 50% water mixture (or in an emergency, just clean water) to the top, close the cap, start the engine, look for leaks and closely monitor engine temperature. You’ll then want to carefully drive to the nearest Isuzu dealer for diagnosis and repair (from Isuzu-trained technicians, of course). To use ABS, don’t “pump” your brakes. Just hold the pedal down and let ABS work for you. ABS does not activate until the speed of the vehicle reaches 5 mph (8 km/h). At each startup, when the brake pedal is initially pressed, a pulse may be felt in the brake pedal and a “click” sound may be heard as the ABS self-checks. During operation, ABS causes the brake pedal to pulsate, and it may push back against your foot. A pulsating brake pedal may be an indication of a slippery road. At this time, a sticking or popping sound may be heard from the brake system. When the brake is applied while turning corners or driving over sharp drops or rises in the road, it can lead to the activation of ABS. The anti-lock feature is designed to help you maintain steering control during braking, but there could still be some loss of steering control in certain road and weather conditions. Always use common sense in all driving conditions and adhere to posted speed limits. The operation of ABS on gravel, deep snow or bumpy roads, or when using tire chains, may result in a longer stopping distance than for vehicles without an Anti-lock Brake System. Anticipate for this in your driving by maintaining sufficient stopping distances. Avoid fast starts away from lights and stop signs. Whenever possible, take advantage of through streets to avoid traffic lights. Also, pace your driving to avoid unplanned stops. Frequent stop-and-go driving will cut down on your miles per gallon (kilometers per liter). Avoid long idling. Idling engines use fuel too. If you’re faced with a delay of more than a few minutes and you’re not in traffic, turn off your ignition and start again later. Avoid repetitive, harsh stopping. Harsh stops can also waste fuel; instead of moving the vehicle, the energy is wasted as heat in braking. Properly lubricate your vehicle. A well-lubricated vehicle means less friction between moving parts. Refer to your owner’s manual for the proper lubrication intervals. Replace your air cleaner at the proper intervals, which are specified in the maintenance schedule of your owner’s manual. Your vehicle gets its power from a mixture of fuel and air, which is taken into the engine through the air cleaner. A dirty air cleaner filter reduces engine performance and can waste fuel. Use the air conditioning only when necessary. When the air conditioning compressor is not on, the reduced engine load can improve fuel economy. Maintain your engine. An engine that is properly maintained will provide better fuel economy than one that is not. One misfiring spark plug will cut fuel economy significantly and will make a difference in the amount of pollution emitted from your vehicle. Lighten your load. Fuel economy is related to the work the engine must do. The heavier the load, the more fuel it takes to run your vehicle. Keep weight to a minimum by removing unnecessary luggage or cargo. Check your tire pressure often and keep your tires inflated to the recommended pressure. Underinflation not only causes needless tire wear but can also waste fuel. Check your wheel alignment. Improper wheel alignment will cause the front tires to roll at an angle that will result in faster tire wear. It takes power to overcome this improper alignment which, in turn, wastes fuel. Switch to 2-wheel drive whenever appropriate. If your vehicle is equipped with Torque-On-Demand®4-wheel drive, change to the 2H mode position during normal driving using your TOD switch. Drivers should sit as far back as possible while still maintaining control of the vehicle. The front passenger should also sit back as far as possible. Airbags deploy with great force; sitting too close can cause great injury. Children 12 and under are most safely seated in the back-seats, as they can be seriously injured by inflation of the front-passenger’s airbag. Airbags are designed to deploy only once. In the event they deploy, the airbag system will require new parts, which may be obtained and installed at your local Isuzu dealer. It is not recommended that you conduct any airbag repairs yourself. If you suspect trouble with your airbag system, consult your local Isuzu dealer. One of the most appreciated conveniences of Isuzu vehicles is their impressive towing ability. With the proper equipment on your Isuzu vehicle, you’ve got built-in towing power useful for a multitude of activities — from taking the camper to the lake for the weekend to hauling your brother’s old jalopy around the corner. To get the most benefit from your towing ability, get acquainted with the towing precautions and general tips highlighted here and explained in detail in your Isuzu owner’s manual. Don’t enter the Paris-Dakar Rally while towing. Additional care and cautious driving are essential when trailer towing. A vehicle will handle and respond differently while towing a trailer. Do not exceed the posted towing speed limit; higher speeds may cause loss of control. Do ask the elephant to ride separately. When towing a trailer, a gross trailer weight must be observed. This weight varies per Isuzu vehicle, so check your owner’s manual to locate the maximum weight for your model. For your safety and the safety of others, use equipment specifically designed for your vehicle. Improper towing equipment and improper installation of such equipment can cause damage to your vehicle and may also result in personal injury. Your local Isuzu dealer can outfit you with the correct towing gear. Do remember to make a few extra dates with your local Isuzu dealer. Due to the extra load of a trailer, more frequent maintenance intervals will be required to ensure continued satisfaction with your vehicle. Consult your dealer for recommended maintenance and service. Put a little light in your (trailer’s) life. Make sure the trailer you are towing is equipped with lights that conform to federal, state and local regulations. Only use equipment designed for your vehicle. Do make sure your trailer ends up where you end up. Always use a suitable safety chain between your vehicle and the trailer. Safety chains are used to retain connection between your vehicle and towed vehicle in the event the hitch disengages. For proper use and installation, consult your trailer manufacturer. Always check the condition of your vehicle and trailer tires before operation. If they are worn or damaged, replace them. Inflate tire pressure to the recommended cold tire pressure indicated in the tire manufacturer’s warranty booklet in the glove box packet. Underinflated tires get very hot and can lead to tire failure and possible loss of vehicle control. Overinflated tires can cause uneven tire wear. Give your lift a brake. Trailers with a total weight of 1000 pounds or more require trailer brakes that conform to federal, state and local regulations. Never connect a trailer braking system to your vehicle braking system. Braking efficiency and operation will be seriously affected. The owner’s manual you received with your new Isuzu vehicle provides more comprehensive information on all aspects of driving and is a great reference tool. If you need to order a new Isuzu service or owner’s manual, you may contact Helm, Inc. at (800) 782-4356 or visit them online at www.helminc.com. If you need owner assistance that is not provided in this forum, contact Isuzu Owner Relations at (800) 255-6727.